BEN: Into the Spider-Verse will hit theaters next week, featuring a group of spider-powered heroes from alternate realities. We here at the Cube could give you yet another list of who these characters are like many other websites, but that would be boring. Duy and I have been marinating in all things Spider-Man for months now, thanks to the PlayStation game, and as we prepare for Spider-Rama, our weekly discussion of the first 200 issues of Amazing Spider-Man. Consider this your primer for the movie, and for Spider-Rama. DUY: Spider-Verse has quietly become my second most anticipated movie of the year. I'd looked forward to Infinity War and Black Panther for a number of years, but I didn't really have much of an anticipation for Spider-Verse. But the closer the date comes, the more I realize it's #2 on the list of movies this year that I absolutely do not want to miss in theaters. BEN: So we’re going to start off with Peter Parker, the original Spider-Man that most of us know and love. With great power must also come great responsibility. He’s voiced by Nick Miller in this movie, which is definitely going to be a distraction for me. DUY: Nick Miller is such a strong presence in New Girl, which we apparently both watched, and he's using the same delivery here that is just going to keep making me thing of Nick Miller. There's also talk that this Spider-Man will be heavily referencing the Tobey Maguire movies, which I both understand and hate, because those movies were really groundbreaking for their time but are just so objectively bad now. BEN: Anyone that still ranks those high on their personal list, I’m convinced hasn’t actually watched them in 10 years, or is blinded by nostalgia for them. Which is fine, I’m not insulting, because I still watch Transformers cartoons from 1984. DUY: It seems like the main character of the movie is actually going to be Miles Morales, notable for being the first biracial (black/Hispanic) Spider-Man. Created in the separate Ultimate Universe after the Ultimate Peter Parker died, he was eventually brought into the regular Marvel Universe (which is called the 616, as in the 616th Earth, based on an Alan Moore story from way way back) and in many ways is the modern-day version of the original Peter Parker. He's young, in high school, he's smart, he goes through problems. It's probably even more appropriate that that type of character right now is a person of color in New York City. BEN: I remember when they decided they were really going to try new stuff with the Ultimate line, and though most of it didn’t work, Miles was the success story. 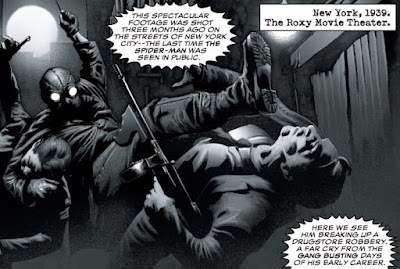 Brian Michael Bendis really shines when he works on characters he created, and you can tell he put the time and thought into the character that made him much more than a gimmick or a regular alternate universe version of an established hero. He resonated, and in a way he was the death of the Ultimate line, because he needed to “count” by being in the main universe. Without Miles, there was no more reason to have that separate brand. DUY: So quick story here, when they first announced Miles Morales, I was initially skeptical and thought that it was just a cheap cash grab, until a fan online, a black kid who was I think maybe 10 years younger than me at the time, told me that Miles Morales was the single most relatable character he'd ever read and that he really resonates with him. It got me to thinking that hey, as a Filipino, I would like to see more Filipino characters (or any Filipino characters that aren't the Triumph Division), but man, it'd be really cool if there were a Filipino Spider-Man. I think that one conversation kinda solidified me over on the pro-diversity side (it's weird that I was ever on the fence). Every time a diverse chocie happens and people complain about it, that's the conversation I think of. Some things are bigger than nostalgia. Some things are bigger than the status quo. Representation is one of them. Miles is also in the PS4 game, and I hope he's playable in the next game. 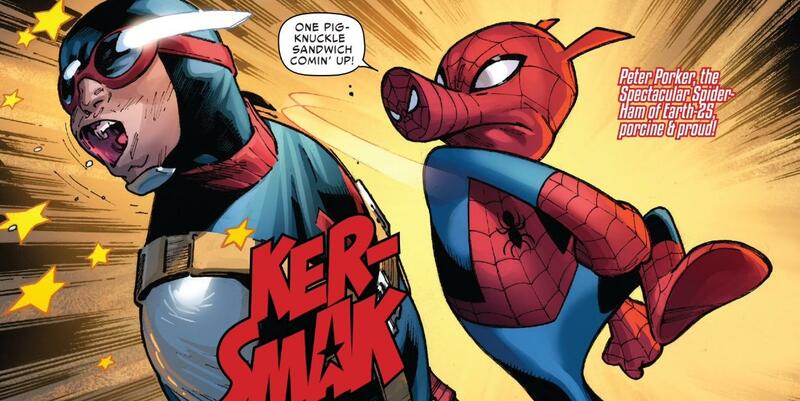 DUY: It looks like the oldest character here who isn't Peter Parker is Spider-Ham, who debuted in the 80s as part of Marvel's Star Comics line. A spider who got bitten by an irradiated anthropomorphic pig named May Porker, Peter Porker is the Spider-Man parody. BEN: I had a few of these comics as a kid and I remember thinking they were funny. As an adult, they’re basically just puns. Look, it’s an eagle as Captain America. DUY: Yeah, to be honest, the comedy is tame at best. We'll see how he works with these others. BEN: He works better when he’s the extremely absurd variation amongst more “normal” characters. DUY: It's very, very possible he's going to easily steal this movie. DUY: Neither have I. 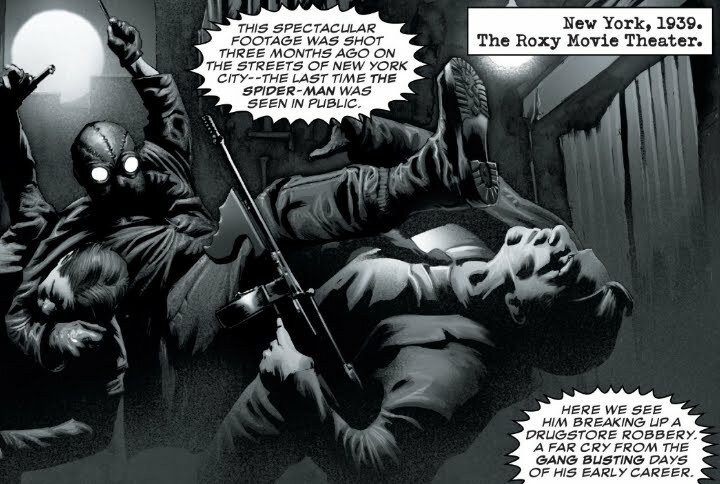 But I think Spider-Man Noir works well contrasting with the other regular Spider-Men because he's so dark in nature, and can really highlight their less vicious side. 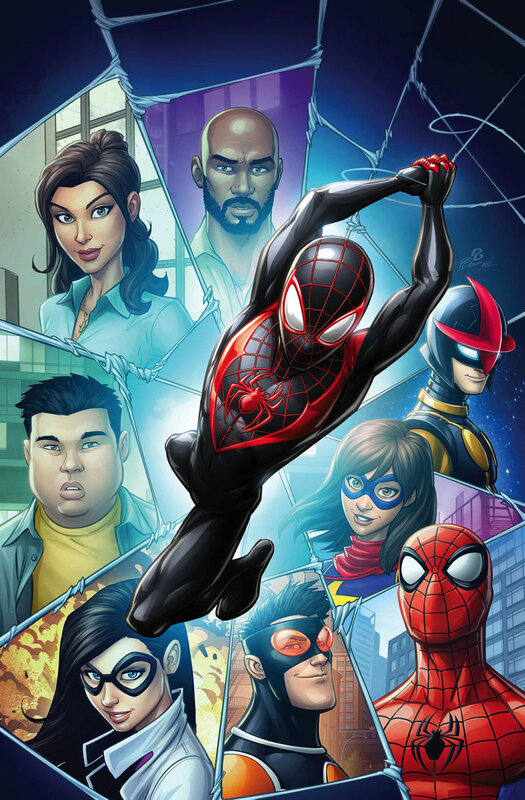 DUY: The movie seems to be based on two specific sets of comics: Miles Morales' origin story, and a 2015 event called Spider-Verse, in which Spider-people all around the multiverse are gathered to fight the Inheritors, a group of, for lack of a better term, Spider-craving vampires. This was a huge event that led to spinoffs, miniseries, and new characters being created. One such character was Peni Parker, who controlled the robotic suit known as Sp//dr. This seems to me to be partially inspired by the 1970s Japanese Spider-Man show, where he had a super sentai and is apparently one of the first super sentai characters. 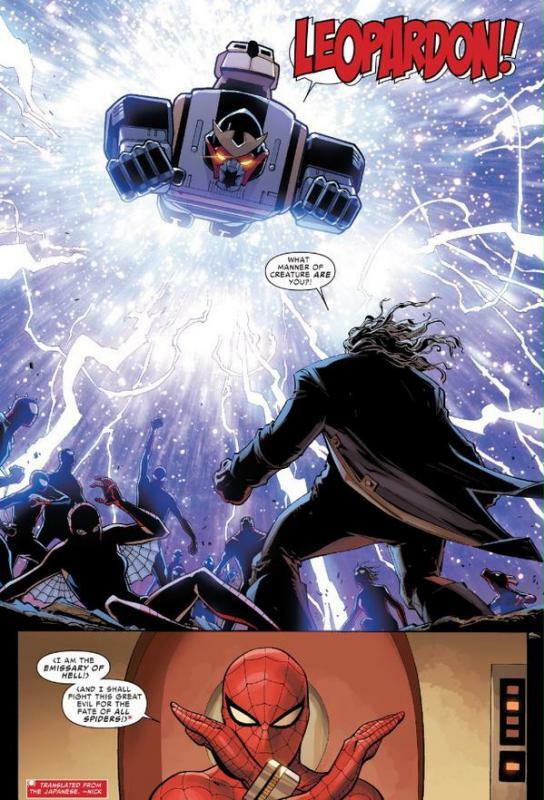 It's kind of weird to think that Spider-Man's reach extended as far back as having a giant super robot back then. 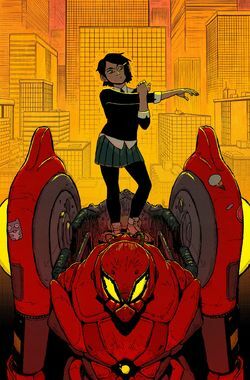 DUY: Peni hasn't actually shown up much since, but she is currently in the Spider-Geddon series. BEN: Spider-Verse is one of the greatest concepts for a big event comic ever conceived (and only Spider-Man, Batman, or maybe Superman have had enough alternate interpretations to even support it) but unfortunately the execution of it (and its sequel Spider-Geddon so far) didn’t quite live up to its potential. DUY: Superman has already done it in Final Crisis: Superman Beyond, but even there, it was limited to two issues, and was probably the way to go. BEN: It’s brightest moments were in the ancillary comics, with the aforementioned Peni (not to mention the character we’ll be discussing last) or in fun comics where the Spider-Man of the 1966 cartoon makes an appearance. But I think that’s where the problem comes in. The writers get too enamored with the Spider characters talking to each other, that the story takes a back seat. DUY: I'm such a multiverse mark and was really enjoying it until the resolution, which just felt like Dan Slott ran out of pages to wrap things up. BEN: That’s what I said! DUY: To be fair, that's kind of a microcosm of how I feel about his run as a whole. It's still the third-best Spider-Man run ever though. BEN: Last but not least, the breakout character of Spider-Verse is Spider-Gwen. Gwen Stacy was Peter Parker’s first love in the 616 universe, before meeting a tragic end. In this alternate universe, Gwen is the one that gets spider powers, but it’s her amazing costume design that really captured the attention of the fans. DUY: Gwen was created just for a one-shot in Spider-Verse, but her origin, the fact that she was a college student who played drums for a band, and her costume like you said, propelled her into having her own series. It was kind of amazing. 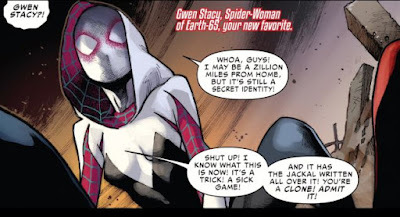 The costume's very Ditko-like too, with the hidden spider, but I think the whole thing about her can be encapsulated in her first appearance in the main Spider-Verse event, where she's described as "Your new favorite." BEN: The history of superhero comics is littered with failed attempts to make new teenage characters seem modern and fresh (see Danny Ketch, Nova, Superboy, or Darkhawk) but Jason Latour and Robbi Rodriguez were able to make Gwen seem like a real teenage girl. BEN: Gwen became so popular that Marvel did an entire month of Gwen themed variant covers across their entire publishing line, and fans loved the Deadpool variant cover (and costume) so much, that Gwenpool ended up getting her own comic too. DUY: She's going by Ghost Spider now, I assume to differentiate her from Jessica Drew, Spider-Woman. DUY: We've discussed all the characters in the picture, so is there anyone else you'd like to see in the movie? Personally I'd love a shoutout to Ben Reilly, the Scarlet Spider, Spider-Man's clone who has long hair and rides a motorcycle. BEN: He’s a clone, not an alternate reality version, dummy! DUY: In Spider-Verse there is a Scarlet Spider who became the main Spider-Man of his Earth. He counts. 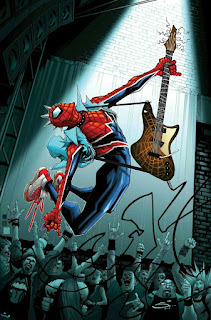 BEN: Another minor success from the comic was Spider-Punk, a punk rock rendition of Spider-Man, so I’ll say him. DUY: Oh yeah, Spider-Punk is Hobie Brown, who in the 616 is Spidey's friend, the Prowler. BEN: Speaking of the Prowler, he’s in this movie too. BEN: He’s in the preview! DUY: As we will cover in Spider-Rama, beginning January 2, 2019, Spider-Man is really the original everyman superhero. His powers make his life worse, not better. And that's been the template for so many characters since 1962. Part of it is the costume and how he's fully covered, and that's an aspect of every redesign of every spider person. They're all fully covered. Stan Lee once said that "What I like about the costume is that anybody reading Spider-Man in any part of the world can imagine that they themselves are under the costume. And that’s a good thing." That's just part of his iconography. Spider-Verse shows the power of thaticonography. Yeah, it's great to have minority superheroes and female superheroes, but it's like totally awesome when they're a Spider-Man. BEN: The concept of Spider-Man is so strong that it still works across multiple cultures and regardless of race, gender, or nationality. DUY: That's it for Spider-Rama today. Be sure to join us in a couple of weeks for our Comics Cube Roundtable about the movie, and back again on January 2nd for the first installment of Spider-Rama, where Ben and I will cover Amazing Fantasy #15, the first appearance of the greatest superhero of all time. Then we'll cover all the Amazing Spider-Man issues up to 200 every Wednesday after that. See you guys then!